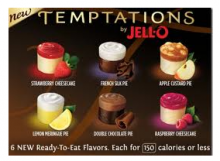 Be sure to check your Kraft First Taste account to see if you have a coupon for a FREE 3-pack of new TEMPTATIONS by JELL-O (up to $3.30). You might have to check over the next few days, it’s seems these coupons come in waves. So if you don’t have one now, make sure you check later. If you’re not signed up with Kraft First Taste, I highly recommend it. It’s been great getting to try new products for free!